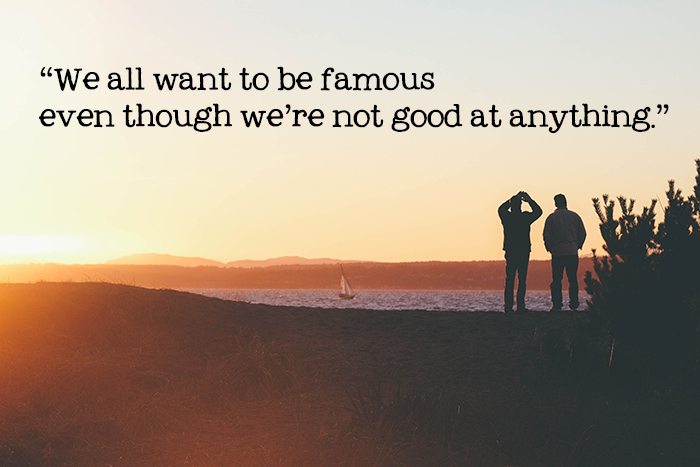 It’s Like We All Wanna Be Famous Even Though We’re Not Good At Anything. Your generation’s addicted to attention. “YES!” I sat up and shouted at the television, scattering balls of used tissues and startling the mutts from their warm puppy slumber. Maybe I was drunk on cough drops, or maybe it was strictly the Codeine talking, but in my cold-riddled mind I had just heard The Truth spoken aloud on the screen, effectively making Martin Sheen — or at least his character — the wisest person on the planet. 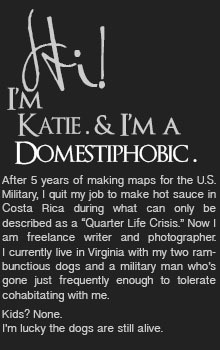 But then Katie Kampenfelt responded. I know. It’s like we all wanna be famous even though we’re not good at anything. “YES!” I shouted again. “She’s the wisest person on the planet!” Then I started coughing uncontrollably and had to lie back down. The cold I caught in Boston was still wreaking minor havoc on my system when I settled on Ask Me Anything as my choice brainless Netflix movie selection for the afternoon. The last thing I expected was for its characters to vocalize a very real fear of mine that’s been simmering below the surface ever since declaring I want to write a novel. What if I sit down to do that thing I’ve been wanting to do my entire adult life and realize I’m not actually any good at it? What if all I really want is attention? What if, like every Facebook status update, like every Instagram photo, like every damn thing I share on this blog, I’m just throwing a big fat mess into the void and hoping at least one person likes it? When I was in the eighth grade, I decided I wanted to be a diver. Not scuba diver, (that came later), but diver, diver. Like chlorine and aerial pikes and high dives and thigh muscles. I thought it was the most beautiful sport in the olympics, and I wanted to be a part of it. I envisioned myself a sleek little dolphin, muscular and petit in my Speedo, swim cap chic. I’d be part of an elite club of athletes, famous for my fearless precision. Mostly though I just wanted people to think I was as cool as I thought olympic divers were cool, and I really felt no real passion or dedication towards the sport. This wasn’t unlike the time I wanted to learn to play the folk harp. The desire happened with such intense fervor that my parents could do little to ignore it. What if they were stifling the next Greg Louganis? Or… um… the next really famous folk harpist? No one wants to be responsible for that. So while I rarely had the coolest toys or most stylish clothes, they almost always catered to my more reasonable (and not-so-reasonable — hello, harp?) whims when it came to self-improvement. Whether that was positive, encouraging parenting or gratuitous overindulgence, who can really say? But the diving. No matter how hard I tried, I couldn’t conquer my fear of the approach. I was afraid to jump forward or, cliché to end all clichés, to dive head first. Inwards? Inwards with a front flip? I could do those all day. They only required me to stand backwards on the board and launch into the abyss. There was no approach. No bounce. Just myself and a single spring before plummeting into the water. But for some reason I couldn’t move beyond my hesitation to fully commit to forward diving which, let’s face it, is kind of instrumental to the sport. I quit soon after. Which, I’ve come to realize, is kind of a theme with me. When a chosen hobby or even profession doesn’t advance in the effortless way I’d envisioned, I’m quick to give up and move on. And I wonder sometimes if maybe I apply that fear to everything I do — that everything I try might be the thing that makes me me, only I’m not approaching hard enough. I’m not jumping head first. Hesitation is rampant. I’ve failed to go all in. And that’s why I can’t quit on this book. No matter how dumb it starts to sound or how many times I want to delete it all and start over, this can’t be the thing I do half-assed. This has to be whole-assed, guys. Because it’s not a dive. It’s not a harp. It’s not a blog or a photo whose primary purpose is to earn me a smidgen of that attention my generation’s come to crave. I just hope to god I’m not not good at anything. Oh darling. You are talking to someone who has tried and failed at the piano, the guitar, and every possible sport. Who has worked in the sporadic fields of: retail, banking, waitressing, writing, photography, online community management… And still am not sure what I want to “do” besides spew my thoughts out into the abyss and snap pretty pics. I felt that way about a marathon…..I would call my husband up, 8 miles from home crying and telling him how I was not going to do that STUPID marathon, how I could not do that STUPID marathon….anyway…I did that STUPID marathon….I admit, it did not go that great….I mean my time and stuff….but I DID complete it…..so get on with it (as it seems you are doing)….have a little conversation with the 38 year old you. What would she say to the present you? Will she be sad you stopped writing??? Probably…..so keep at it!!! 38 year old Katie is gonna be super disappointed if you don’t finish it. Ok so what about when you’re good at everything you try but you’re still not passionate about any of it? Floundering happens on both ends my dear. Personally, I’d rather fall short of my dreams than skate through life having none. “Ok so what about when you’re good at everything you try but you’re still not passionate about any of it?” <-- Is that supposed to make me feel sorry for someone?? ;) But you're right. Now I just have to get the "try" part over with. The good news too is that the first draft doesn’t even need to be good! It just needs to be a draft! Seriously, mine is sooooo full of holes. I know what you mean though in your feelings and level of commitment to things. I tried to learn the guitar once. Ha. I’d still like to but I just don’t think I care enough. I got a ukulele for Christmas last year and that has been fun to learn, and while I am not going bananas with practicing and trying to ace every chord, it’s been fun to teach myself a handful of songs. I’ve been working on “managing my expectations..” haha.. I’m done exams on the 24th, let me know if you want to chat and get a book buddy shove in the right direction! I might need one too to get on my edits. Shifting gears form ocular pharmacology and strabismus to BOOK is difficult! That is like… SUCH a good point. So good (and obvious) that it’s kind of hilarious that it didn’t even occur to me. The first draft doesn’t have to be good!! I’m one of those weird breeds of people who only likes to do something ONCE. It feels like a waste of time if I can’t get it right the first time. But I have to realize that while this is a good theory for home improvement projects, it simply isn’t applicable to novel writing! In fact, it’s BAD for novel writing. I’ve basically made no progress over the last couple of weeks due to WITS and this cold, but I’m starting to feel much better now, so yes. Send me a reminder around the 24th — it’s a date! Seriously, the problem is that every book you’ve ever read has been the finished product. You are comparing your start to someone’s finish without knowing how many versions live in between. Imagine if you could see or read what led up to the end product. Maybe then you’d see just how on track you are. Or, in my case, how far ahead since I haven’t even begun to think about starting. This makes me think of an article I read a while ago about how they did a study on the kind of praise kids get and what kind of person they grow up to be. Apparently, if, as a child, every time you do something good, someone says, you’re so clever, you’re so smart, aren’t you amazing, then the child will only stick with things that come easily to them and as soon as they get a little bit hard, they quit. The kids who succeeded as adults were the ones who were praised for the work they put into doing something rather than the result. So. a) Looks like the self-esteem movement fucked us all a bit, and b) You’re getting there. It’s supposed to be hard, but good for you for trying and putting the time in and doing it. No matter what your result in the end, you will know you did that and you can always be proud of the doing. That does count for a lot. That’s interesting, depressing, and satisfying all at the same time! Satisfying to know there might be a reason why I am the way I am, but depressing to know my lack of follow-through has possibly been bred into me through good intentions. ;) Thanks for the encouragement!! Did you ever finish the book?